The Lincoln Highway Heritage Corridor is sponsoring a one-day bus trip along the Lincoln Highway from Greensburg to Everett, Pa., (and back) on Monday, October 11, 2010. The “ultimate road trip” will be guided by Lou DeRose, the ultimate Lincoln Highway fan, and Olga Herbert, the Executive Director of the LHHC. Both know this route inside and out and will share little-known facts about this country’s first coast-to-coast route. In addition to photo ops at four Roadside Giants and four Lincoln Highway murals, bus guests will be treated to a lunch buffet at the Omni Bedford Springs Resort followed by a private tour. The day begins with a private guided tour of the historic Compass Inn in Laughlintown led by Innkeeper Jim Koontz. After lunch they’ll head to Everett for a photo op of another Roadside Giant followed by visits to Bedford’s art deco Dunkle’s Gulf Station and the 1927 Coffee Pot. Dinner is at the historic Jean Bonnet Tavern with time to browse the Cabin Gift Shoppe. Departure is from either Greensburg’s Hempfield Square or Latrobe 30 Shopping Plaza. Make your reservation TODAY at www.LHHC.org where you can pay online or call (724) 238-9030. The travel package ($115 per person) includes the guided tours of Compass Inn and Bedford Springs, lunch at Bedford Springs, dinner at Jean Bonnet Tavern, and a photo memento. Sorry, no refunds. 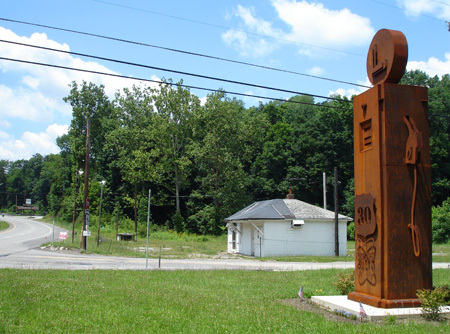 I’ll be giving a PowerPoint presentation tonite just a few miles from the site of the S.S. Grand View Ship Hotel, the best-known roadside attraction along the Lincoln Highway until it burned in 2001. Central City is the closet (tiny) town so everyone there worked at, ate at, and celebrated at the Ship — should be lots of fun. 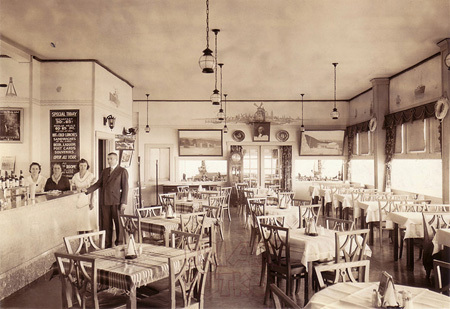 Here are photos of the Ship Hotel’s dining room about 1940 and the outside about 1975. That kid looks like me! But it’s not. Olga Herbert, executive director of the Lincoln Highway Heritage Corridor in Pennsylvania, has a friend who wants to sell his collection of Ship Hotel memorabilia. Anyone interested in purchasing part or all of the collection should send their name and phone # to Olga at office@LHHC.org. In about a week, she will send the info to him and he will follow up by telephone. NOTE: no portion of the profits will go to the LHHC, she is doing this as a favor since he doesn’t have e-mail. The complete story of the Ship Hotel is due out in March in a book written by, well, me. I began researching the Ship in 1988 and became friends with Clara Gardner, granddaughter of founder Herbert Paulson. Clara is gone now but her children graciously permitted me to use many, many family photos. Look for more peeks inside the book in the coming months. I hear that all the time from Dunkle’s Gulf and Lincoln Motor Court. People love to stop for a snapshot, but then get gas at the BP and check into the Hampton Inn. In an effort to get more (and a younger Lincoln Highway fan base) we have begun a LHHC geocache. One of the sites is at Lincoln Motor Court. Geocachers and the Altizers [who own the motel] really enjoy it; feedback is posted on http://www.geocaching.com. It appears many have driven by Lincoln Motor Court and always wondered about it. Now they are stopping, meeting the Altizers and checking the place out. Hopefully, it will turn some adventure seekers into Motor Court guests. There are a number of geocaches along the LH such as at the restored Coffee Pot nearby. Learn more about the motor court one HERE. Just visited there 8/7/09. Loaded with nostalgic charm and spotless! Glass doorknobs, vintage lace curtains and bedspreads-SIX pillows on my bed and bedside plate of mints. Windowbox full of flowers, complete with friendly owner critters-cat came in to nosey around my cottage! Old fashioned tile bath w/porcelain fixtures and fabulous old wooden window. Cable TV, microwave, mini frig, and coffee pot plus glass mugs. Only drawback was Route 30 is noisy even late night if you sleep light. Will find a reason to return! Owners were friendly and accommodating! We just stayed overnight in Bedford at the Lincoln Motor Court. The LMC is a true 1920s era experience, including the Altizer’s 1920s era hospitality. The cozy cabins are tastefully updated but the quality of construction from that era is still very apparent. Don’t worry about the lack of air conditioning, even in mid-August. The crisp mountain air had us scrambling to get under a blanket! We also ate at the Jean Bonnett Tavern and saw Dunkle’s Gulf, which are in your book. Bedford has street concerts Friday nights in the summer in the center of town; you lose sight sometimes just how friendly people are. After visiting Sue’s hometown in Ohio we picked up the LH in East Liverpool and drove it, including Cindell Street, to Canton. We stopped at the Hot Dog Shoppe in East Liverpool and the Steel Trolley Diner in Lisbon (both in your book) and at Bob Lichty’s auto showroom in Canton. I have autographs in your book from the places where we stopped. 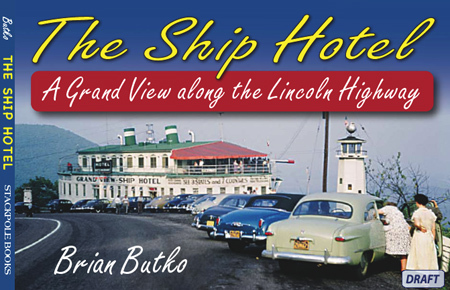 After much back and forth debate, Stackpole Books has finalized the cover to my next book, The Ship Hotel: A Grand View Along the Lincoln Highway. It shows the Ship in the early 50s, when crowds were still coming despite the lure of the parallel Pa. Turnpike. I was hoping for more nautical touches but I’m thrilled they chose to feature this beautiful view from good friend Cy Hosmer. 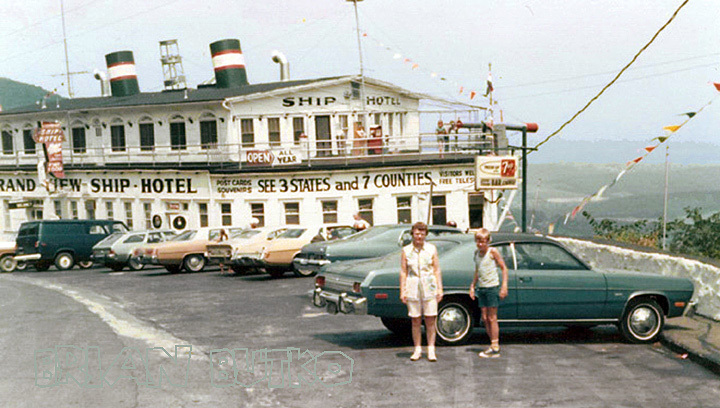 The Grand View Ship Hotel was once the best-known attraction along the coast-to-coast Lincoln Highway. It’s burning in 2001 broke hearts far and wide. Today all that remains are a few scattered scorched remnants below the 1920s wall (see my brief clip below). My book traces the history starting with a roadside stand that served early travelers stopping for the grand view. I got to design the inside, which will feature lots of cool photos printed large. Look for the book in Spring 2010! There’s no breaking news today and I’ve been working nonstop since noon Wednesday to finish my book on the Ship Hotel. It’s getting there but still rough in the Noah’s Ark chapter and the deadline looms hours away. On my trip along the Lincoln Highway to Grand View Point near Bedford, Pennsylvania, I snapped a few sites, including the big praying mantis at the Second Time Around Shop, now laying on its side. Other photos here are the LHHC mural and gas pump in Stoystown, the Washington Furnace Inn closed and for sale, and the rebuilding of the burned Sleepy Hollow tavern and restaurant. I drove east on the Lincoln Highway last weekend to wrap up my research on the S.S. Grand View Ship Hotel. 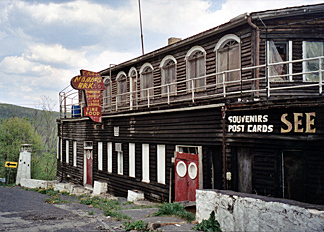 The Ship, west of Bedford, PA, was one of the best-loved roadside attractions until it burned in 2001. Good weather, a productive trip, lots of photos, and a good book on tape made it fun, but it’s still sad to see the Ship gone and odd to see so many places changed. Old signs gone, new buildings in operation, more lanes for traffic. Little now changes at Grand View Point. Vandals have taken about all they can, particularly from the lighthouses that once graced each end of the wall. Here’s a very short clip of what remains – not at all exciting but it documents what’s there today. I posted another on YouTube taken when I crawled down the hill.